We love comfort food in our house. Especially when it’s a skinnier version and comes together super quick to keep us on track with our healthy eating resolutions. 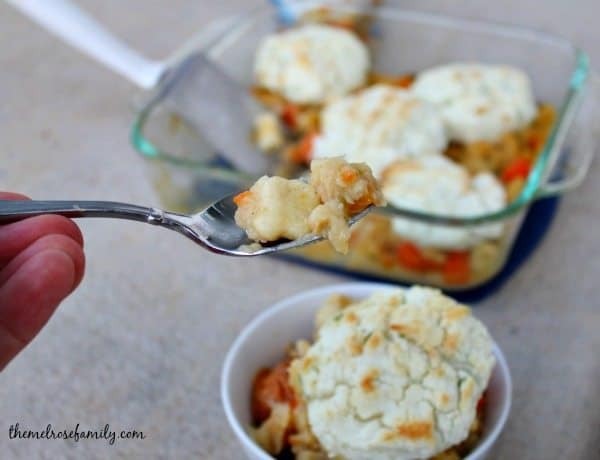 Our Skinny Chicken and Dumplings is a great lunch or dinner idea that’ll warm you up quick on a cold day and helps keep #ProgresswithProgresso. You’ll need two ingredients for this skinny version of Chicken and Dumplings. The ingredients are a can of Progresso Light Chicken & Dumpling Soup and Gluten-free Bisquick. That’s it! Plus, right now you can grab a coupon to save $1 when you purchase 4 cans of Progresso Soup. Just download it from HERE. 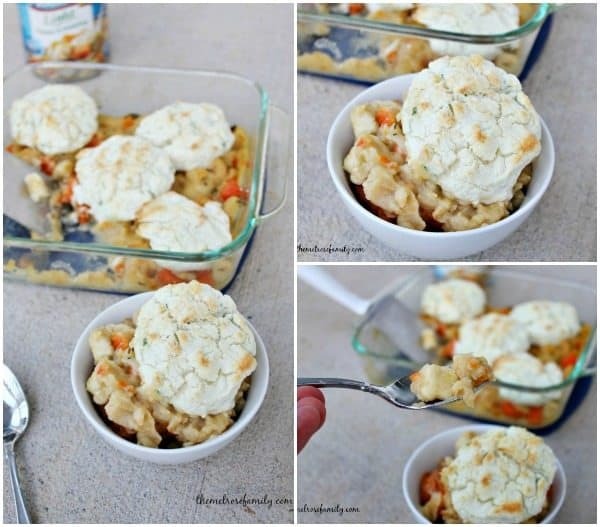 If you’re not using the Progresso Soups to make this Skinny Chicken & Dumplings, then they make the perfect lunch idea that’ll give you #ProgresswithProgresso. 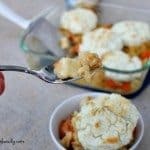 I topped our Chicken & Dumplings with super simple chive biscuits using the gluten-free bisquick mix, but it’s not necessary. My girls definitely liked the addition of the biscuits though. The biscuits were 2 cups of gluten-free bisquick mix with 1 cup of milk and a tablespoon of fresh chopped chives. 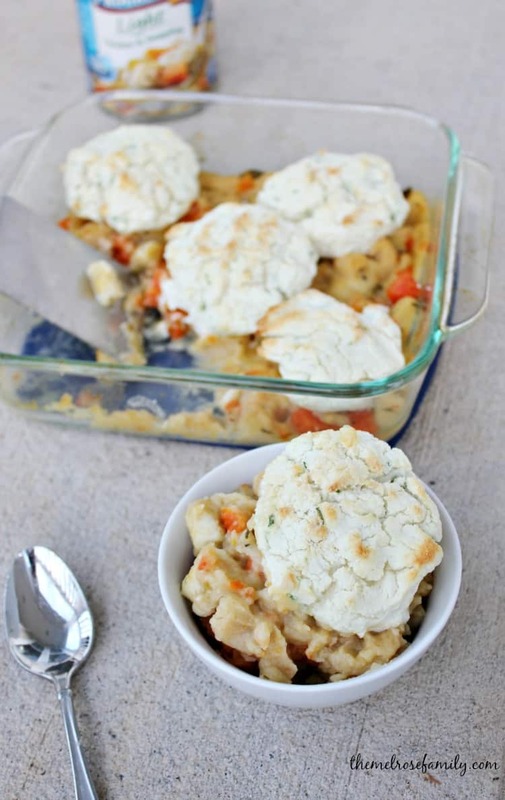 I set the biscuits right on top of the chicken and dumplings mixture and baked them that way. Super easy, but definitely not necessary every time. Especially if you’re trying to cut back the calories. Any of the Progresso Light soups would make a great lunch idea. We like to bring in a little bit more comfort when it comes to dinner and this was the perfect way to do that. 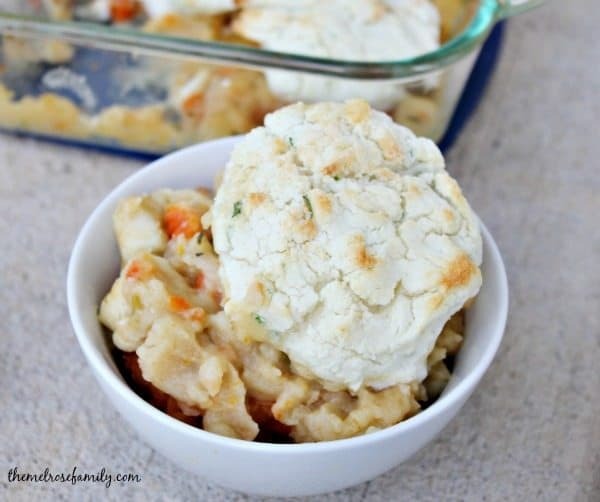 A super simple, yet comforting Skinny chicken and dumplings. From the soup cans pour out as much broth as possible, while leaving the chicken and vegetables in the can, into a large pan. Over low heat add the 1/2 cup of gluten-free bisquick mix to the broth and stir so that the broth thickens. Add in the strained chicken and vegetables to the thickened broth and mix to combine. You can serve directly from this or bake in the oven in a casserole dish at 350 F for 20 minutes with the chive biscuits on top. To make the chive biscuits combine the bisquick mix, milk and chives and create hamburger size biscuits to place on top of the chicken & dumplings mixture. Leave me a comment on how Progresso Light Soup can help you stick to your resolution and be entered to win $15.